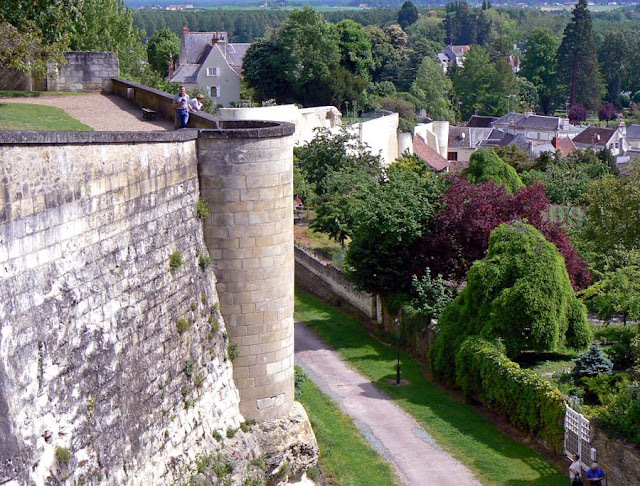 The medieval city of Loches is perched high on a bluff overlooking the valley of the Indre River. The bluff is surrounded by walls that formed the defense of the city. On the south end is the old castle, whose donjon tower still stands. It's great fun to explore with caves and towers and artifacts from the old days. You can climb the 160 steps to the top of the eleventh century donjon for unobstructed views of the surrounding countryside. "Hello down there!" "Hello up there!" On the north end is the newer Renaissance château, also a nice place to tour, with great views of the newer town down below. The ramparts surrounding the medieval city measure about one kilometer in length and have only two gates allowing entrance to the city. I have no idea who the people in this picture are, but I think it's cool how it looks like the two women are trying to communicate. I don't remember if they actually were talking (or shouting) or if this was just a coincidence. In more timely news, today is the last day of the hunting season. On my walk with Callie this morning I could hear the hounds barking, the hunters shouting, the horns blowing, and the guns going off. Callie flushed two deer out of the vineyard. The sun is bright in a clear but very cold morning sky. I could hear a train in the distance, and woodpeckers doing their thing on trees. All the little puddles are iced over. It was a nice walk. 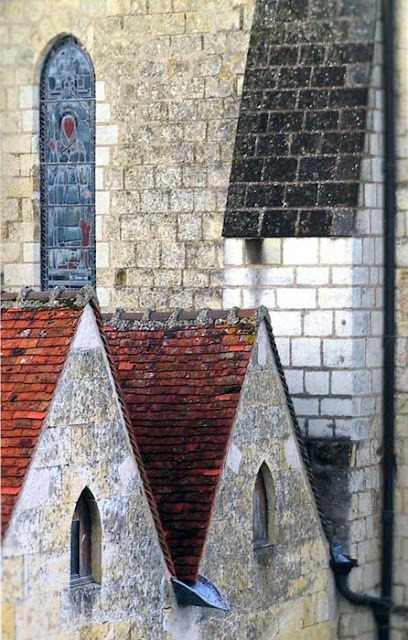 This is a view of some of the roof elements on the royal logis in Loches. I like the photo, but the reason I rejected it the first time through is that I really don't like the alignment of the three primary elements. I would have preferred to have the round tower on the bottom right a little more toward the center so it's not directly in front of the chimney. Another problem with the original picture is that the spire on the turret to the left rises up too high; keeping it in the frame meant that there was too much blue sky and not enough roof to balance the image, at least to my liking. So I shortened the spire for this picture. Thanks, Photoshop! I don't know why I didn't notice these things when I was taking the photo. It may not have been possible for me to move into the position I wanted because of buildings or trees in the way. 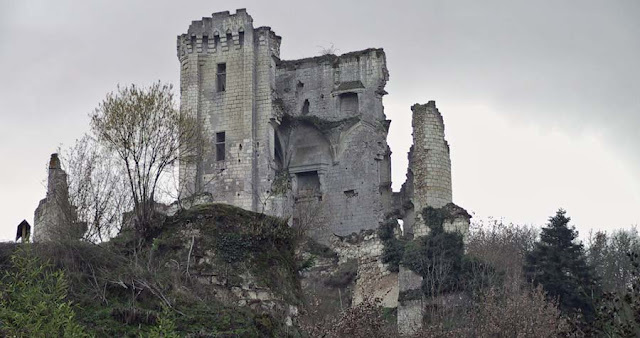 I will have to go back to Loches and try again. I think I'll wait for better weather. This is a little pocket park in Loches, just outside the gate to the upper medieval city. If it's not too busy, you can park your car right across the street in a small lot along the ramparts, otherwise you need to park below and walk up. Next to the gate there's an informational sign about the medieval city and this little park which features a free public restroom. A very inviting place to rest on a warm summer day. The bench is there for resting while you and your friends take turns using the facilities. There's also a nice overlook of part of the newer town below. This little series of photos from Loches was taken during a summer walk around the town. I'm still sifting through some older photos and trying to give them new life. For one reason or another, I rejected these pictures the first time through. 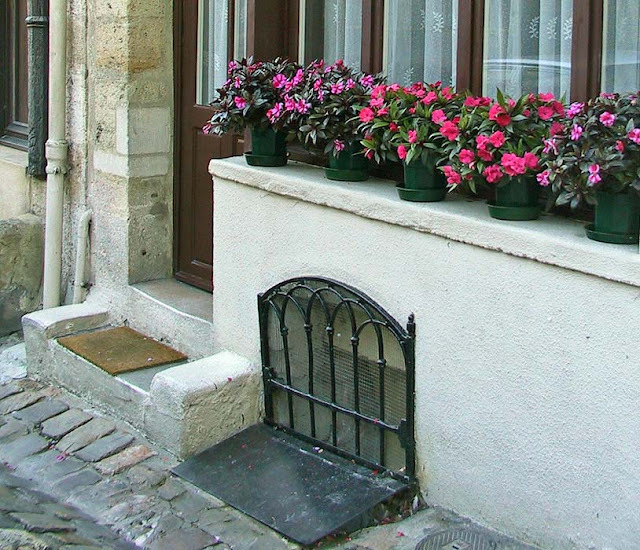 Impatiens adorn this windowsill in Loches. Now, since we're in the middle of winter, I'm finding time to work on them a bit and bring them to the blog for the first time. I hope you're enjoying them. I'm always amazed at the little details in the buildings and streets and walkways in these old towns. The places are almost always lived in, but sometimes you wouldn't know it. Curtains are drawn, shutters are closed. But the signs of life are everywhere, from freshly painted doors to meticulously maintained flower pots on window sills. Many of the churches one can wander into in France, Catholic as they are, will have votive or prayer candles of one style or another lit. Sometimes they're in red glass votive holders, other times they're in more ornately painted glass containers. But many times they will be simple tall tapers held in old iron candelabras. Tapers burn in the Collégiale St.-Ours. This was a rather plain one-row candelabra in the Collégiale Saint-Ours up in the old medieval section of the city of Loches. Only the bell tower survives in the square where the Church of Saint-Martin once stood. 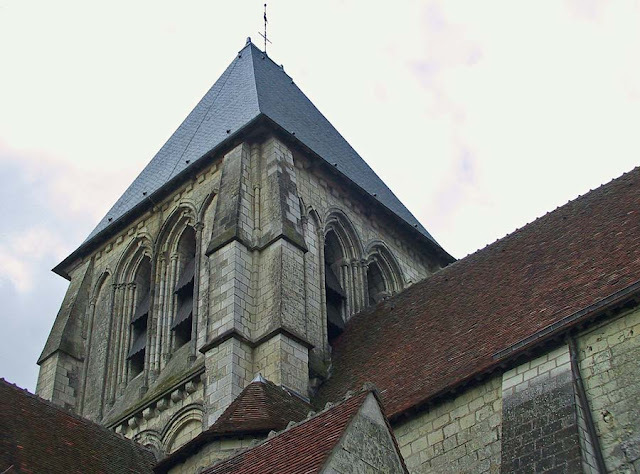 The church was built in the fifteenth and sixteenth centuries, but was weakened by modifications after the Revolution. Its roof collapsed in 1854 and the church was demolished. The bell tower of the former église St.-Martin. Since then, the space occupied by the church has been transformed into a public square. Gargoyles are fascinating bits of architecture. They come in all shapes and sizes from the purely functional to the ornate and fantastical. The ancient Egyptians, Greeks, and Romans used gutter systems and gargoyles to throw rain water away from their buildings' walls. A rather plain and unassuming gargoyle. 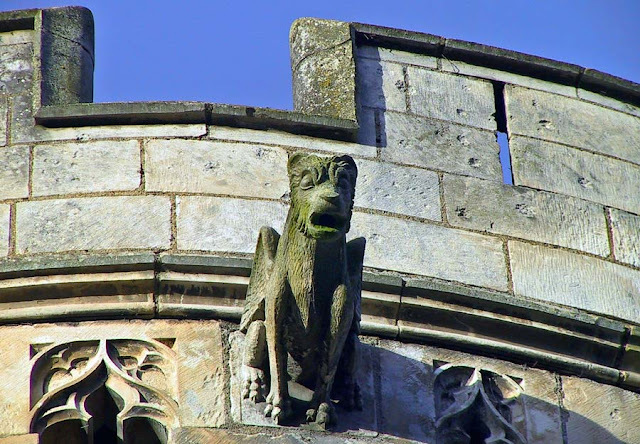 The gargoyles that we are probably most familiar with are carved in the shapes of grotesque animals peering down from the heights of gothic cathedrals. In addition to their water spouting duties, such gargoyles are said to have had spooky supernatural purposes like warding off evil spirits. I would expect no less from waterspouts on religious buildings. I saw this one on a small castle-style building in Vendôme. I believe the building is the Porte Saint-Georges, a gate into the city where a bridge crosses the Loir. It was built in the fourteenth century but was embellished with more ornate features in the sixteenth century by the duchess of Vendôme, Marie de Luxembourg. The city council has met in the building since then. Vendôme is the northern of the two sub-prefectures in the Loir-et-Cher département. 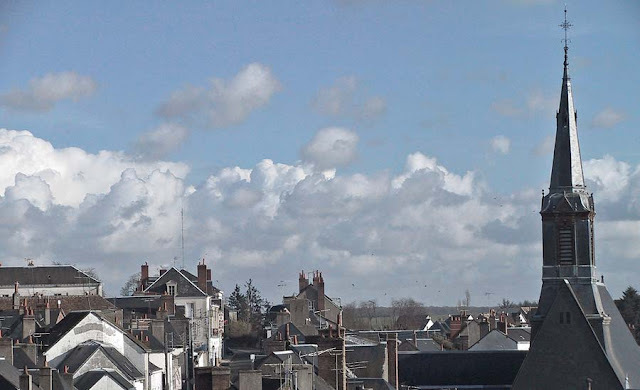 The other, in the southern end of the département, is a small city called Romorantin. The main prefecture is in Blois. That's a little play on words... get it? Here's another shot of the Collégiale St.-Martin in Troo, just for fun. The bell tower of the collégiale in Troo. Today is the day of the two NFL Conference Championship games in the United States. But I won't see them today because of the time difference. I'll get up at 7:30 on Monday morning to watch both games re-broadcast. Should be fun! For the last few posts, I've been talking about the Loir River. Le Loir, as opposed to la Loire. 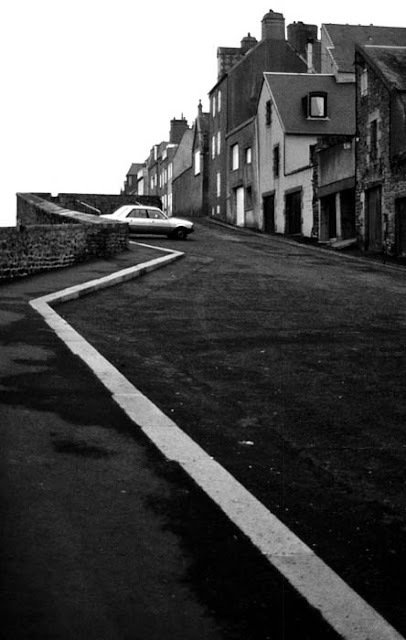 You may also have noticed that the départment we live in is called the Loir-et-Cher; there is no "e" on Loir. I was confused when I first moved here because I really didn't understand what this was about until I looked at a map. 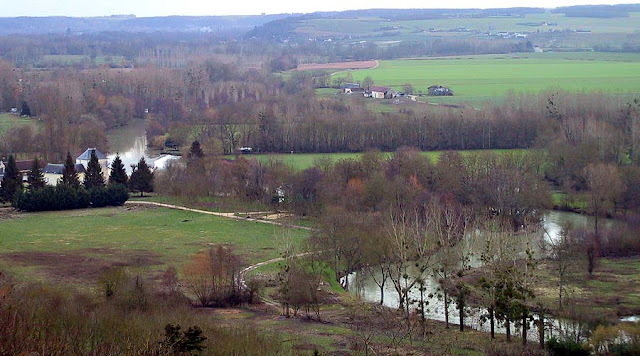 The valley of le Loir at Troo. La Loire is the longest river in France, and the Loire Valley is famous for its historic châteaux and its expansive wine industry. Along la Loire are the cities of Orléans, Blois, Tours, and Nantes, to name a few. La Loire runs roughly east-west through the middle of our département. But the Loir-et-Cher takes its name not from this big river, but from two of its lesser tributaries, le Loir to the north and le Cher to the south. In French, la Loire is known as un fleuve because it empties into the sea. Two other well-known fleuves in France are la Seine (which runs through Paris and empties into the English Channel) and le Rhône (which runs through Lyon and empties into the Mediterranean Sea). But the Loir and the Cher are not fleuves. They are called rivières because they feed other rivers as opposed to emptying into a sea; we would call them tributaries in English. Le Loir runs into la Sarthe which, in turn, empties into la Maine which is itself a tributary of la Loire near Angers. Le Cher empties directly into la Loire just downstream of Tours. And just to make things a little more confusing, while le Loir (big "l") is une rivière, le loir (small "l") is a tiny rongeur (rodent) that we call a dormouse. By the way, la Maine is a curiosity in France in that it is une rivière without a traditional source. It is formed by the confluence of three other rivers and flows for only twelve kilometers before it meets the Loire. I can think of at least one major river in the United States that is formed by the joining of two smaller rivers. And that river itself is only a tributary in an even larger river system. Further down the Loir River from Lavardin is the equally tiny town of Troo. It, too, sits high on a bluff overlooking the little river valley. These days the town is home to about three hundred Troiens. On our brief January visit, we climbed up and around the bluff taking in the sights below. Details from the collégiale St.-Martin in Troo. 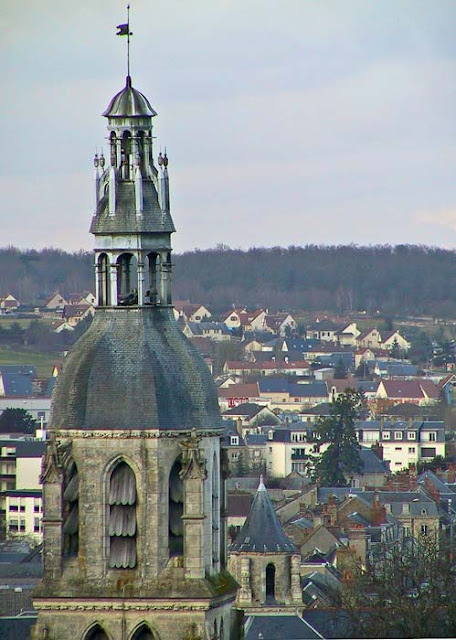 The church in town is a collégiale, like the church in St.-Aignan. It's built very close to the top of the bluff and it's very photogenic. I don't recall the church being open when we were there; I only have exterior shots. If you're wondering, Troo is pronounced like trop. In English, it rhymes with go. I suppose it's not the only one. 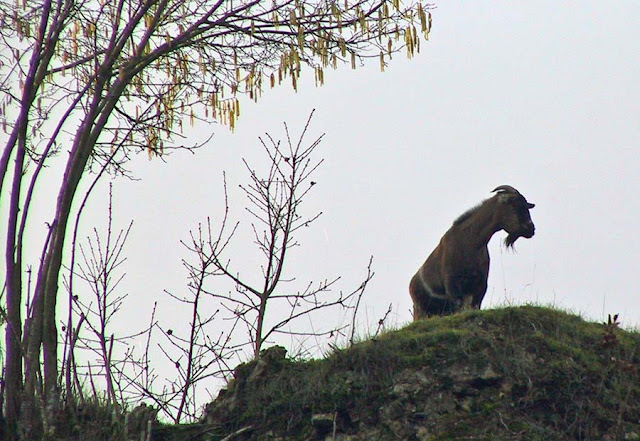 This goat was standing in just the right place for me to capture its silhouette against the winter sky. It was almost ghostly. Are there such things as were-goats? You know, like werewolves, only goats? I didn't think so. Were we watching the goat, or was it watching us? I don't remember if there was a small herd, or just this one. But there it was. The castle on this site, built and enlarged between the eleventh and fifteenth centuries, was a strategic military installation between the lands of the Capetians and the Angevins of medieval France. What's left today are only ruins, but they're pretty impressive seen from below. The ruins of the keep at Lavardin. Apparently, you can tour the ruins. They're open from the end of May through September. As we were there in January, a close-up view was not in the cards. 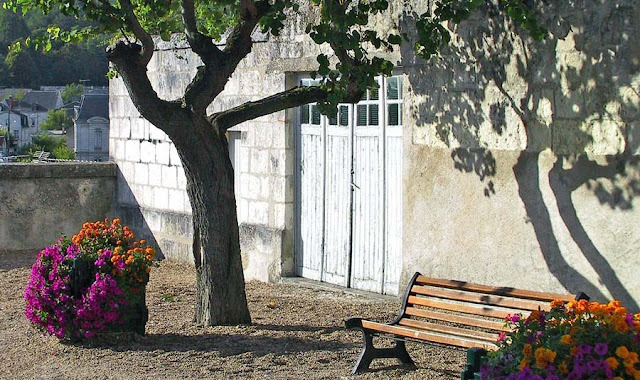 The château is not far from us, so a summer time return trip might be a good idea. This way to the castle. Lavardin is a tiny town (population just over 250) on the Loir River in the northern reaches of our département, le Loir-et-Cher. It's not far from Vendôme. The town is known for its picturesque setting and the ruins of an eleventh century château high on a bluff above the river. It was impressive enough in the dead of winter; I imagine it would be quite a sight in summer. Le Prieuré St.-Genest in Lavardin. 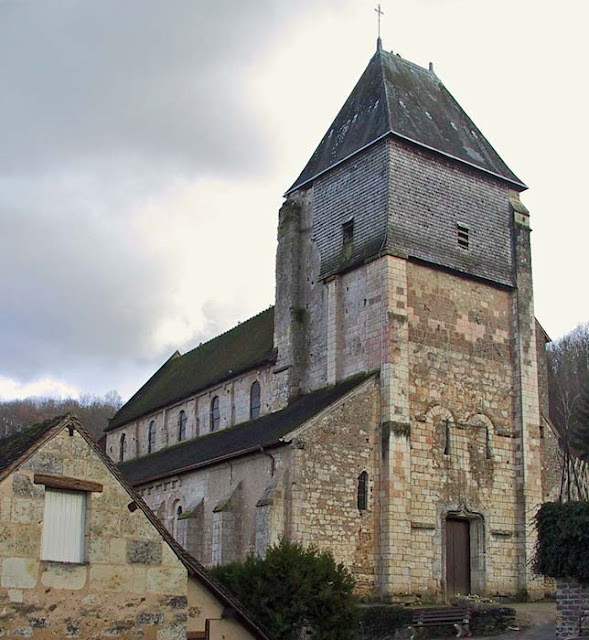 The church is a Romanesque structure, dating from the early twelfth century. We didn't go inside the day we visited in January, but apparently there are impressive frescoes and murals inside spanning the twelfth through the sixteenth centuries. Saint-Genest was a third century Roman actor who apparently and quite publicly converted to Christianity during a performance. He was decapitated for it. Interestingly, Genest is likely an earlier spelling of the word we know as genêt (scotch broom). I thought the turret on this house in Château-Renault was pretty cool. I kind of wish our own house had a neat feature like this, but our's is just a simple rectangular box. Not that there's anything wrong with that. Slate roofs and clay chimneys. I really like the detail in the slate roofing tiles on the turret, the way the sizes and shapes change from top to bottom, the subtle slanting design close to the top of the cone. And the weather vane is a nice touch. 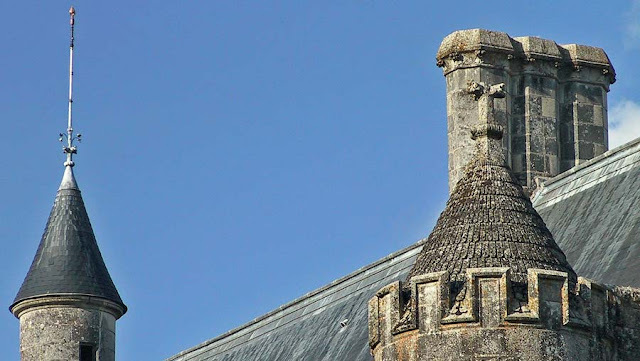 The terra-cotta chimney pots are called mitres in French. We found that out when we had our wood stove installed. The fireplace guy told us we needed to add a mitre to the chimney to lift it higher from the roof line. Building codes and all. About halfway between Tours and Vendôme, on the route nationale 10 which leads to Paris, is the little town of Château-Renault, population just over five thousand. The town is situated at the confluence of the small Brenne and Gault rivers in the northeastern part of the Indre-et-Loire département. 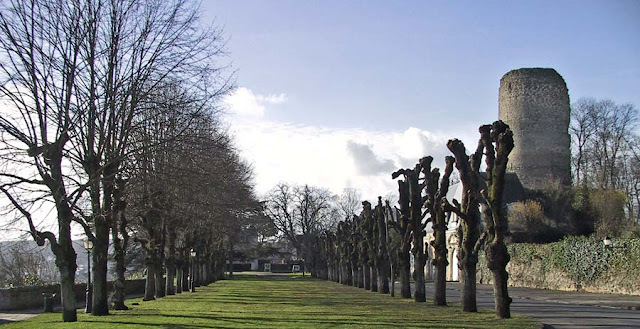 Ken and I visited the town very quickly on a sunny January day back in 2004. The ruins of the château, originally founded in 1066, sit on a bluff above the town next to a grassy esplanade lined with tilleuls (linden trees) overlooking the town below. There weren't many people about that day and we enjoyed the views from the esplanade. The tilleul-lined esplanade with the old château's donjon on the right. Most of all, we enjoyed the warmth of the mid-January sun on our pallid winter faces. Actually, it felt more like a gale. Especially on the platform of the Cultural Education Center, which is lifted a couple of floors above the main plaza level of the state office building complex. 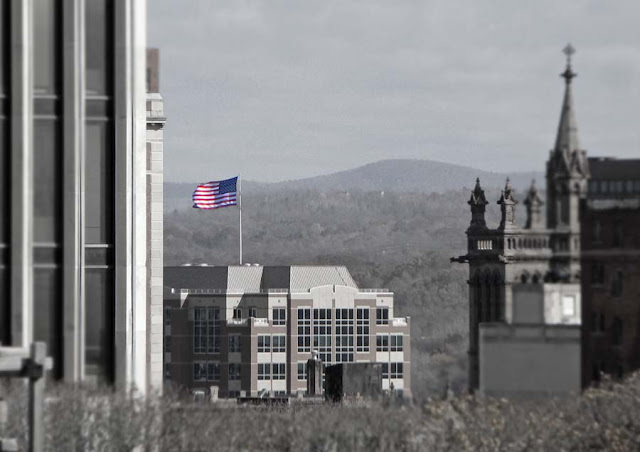 A flag atop 677 Broadway, Albany, New York. Every flag that was flying on that Saturday morning was ripping toward the north, pushed by the hard south wind. This one is on top of the 677 Broadway building, about a half-mile away from where I was standing. The church spire is St. Peter's Episcopal Church on State Street which, I've since learned, is built in the French Decorated Gothic style. It's the third church on the site and was built in 1860. I need to go back the next time I'm there and take a closer look. It's strange how one can grow up passing these incredible buildings regularly and not even notice them. I wasn't too thrilled with the original photo for a few reasons. First, the church steeple was a little blurry. Second, the flag is backwards. And third, the flag was kind of lost in the color image. So I worked on it in Photoshop to enhance the blur and mute the colors (except for the flag). I even flipped the photo so the flag was no longer backwards, but then the buildings were in the wrong place and that bothered me, so I flipped it back. I'll have some more France photos starting tomorrow. In 1965, Alexander Calder created this sculpture for the new state government office building complex in downtown Albany, New York. The jet-black "Triangles and Arches" is right at home in the center of the southernmost reflecting pool on the plaza, between the state capitol to the north and the Cultural Education Center on the south. I think this accessibility ramp was a later addition to the plaza stage. In the photo above, you can just see the sculpture behind the access ramp to the plaza stage. I thought the lines and shadows of the ramp's purely functional rail contrasted interestingly with the sculpture and with the plaza buildings around it. When I worked at the plaza back in 1977, I had a great view down onto the sculpture from my seventh floor windows in the adjacent office building. I'm still digging through pictures from my trip to Albany last fall. Bear with me. The United States Courthouse in Albany, New York, is a beautiful example of the Art Deco style of architecture. Completed in 1934, this massive building on Broadway was also home to a U.S. Customs office and the Albany office of the U.S. Postal Service (the Postal Service moved out in 1995). 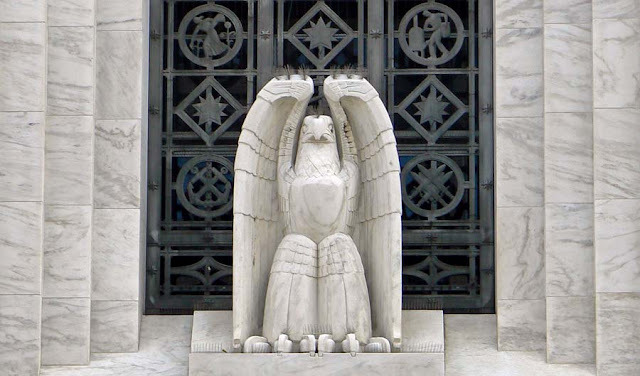 One of the marble eagles over the northern entrance to the building. Among the prominent features of the building are the stylized eagles perched over the two main entrances to the building on Broadway. Each of the eagles is eight feet tall and they were carved from solid blocks of Vermont marble. I would love to have had the time and ability to venture inside to explore the ornate lobbies and take pictures. Maybe one day. The snow on the deck is slowly dwindling away. It melts a bit each time the temperature rises, but the days have not yet been warm enough for it all to go. That may change today as a warm front moves through and brings rain. Some rare morning sun casts shadows from the railing onto the deck surface. For now, I've immortalized the boundary between snow and tile. They Know It's Winter, Don't They? I looked out the back window the other day and noticed some pretty large piles of dirt in the back yard. Some of them are covered in snow, others not. So they're pretty fresh. I had no idea that moles were active this time of year. A mole is called une taupe in French. Guess what color they are? That's right: taupe. Fresh mole mountains in the January snow. We've had our problems with moles in the past. The little critters are a pain because I have to remove their dirt hills before I can run the lawnmower. That leaves big brown patches in the lawn. Many of their tunnels are at the surface which makes the ground uneven and spongy. But I cannot fight them. I've even come to accept them. The moles aerate our packed clay soil. They eat grubs that could turn into garden pests. They don't eat plants or plant roots. The mole dirt that I gather is good soil for the vegetable garden. They are an integral part of our little ecosystem. But why are they digging in the winter? Don't they hibernate or something? Don't they go off to the Riviera or Morocco for the holidays? And if they're this active in January, what's it going to be like in spring? Ok, I'm reaching here. I haven't been out of the house except to walk the dog in a while. And it's been either too cold or too dark to take the camera out on recent walks. I'm reduced to taking pictures out the kitchen window. Our central firewood management facility. This is part of our driveway. 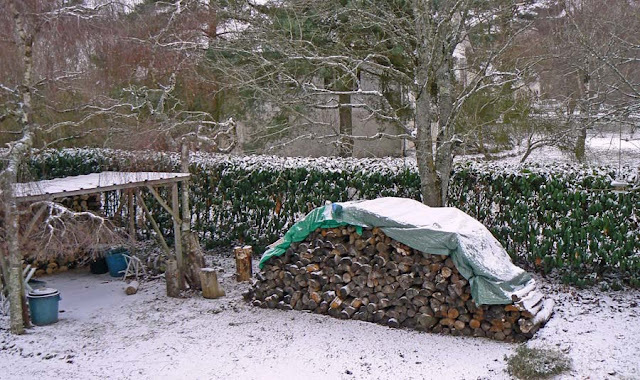 The big log pile under the green tarp is next year's wood. This year's dwindling supply is cut and stored under the carport on the left. The green garbage cans are filled with kindling. I think we'll have plenty of cut wood to get us through the season, unless this below zero weather continues for another month, at which point I'll have to get out there with the chainsaw again. By the way, the car goes in the garage, so that's why the carport is available for wood storage. There's an artificial pond out behind our yard where the vineyard starts. It was made as a reserve in case of fire. We're fortunate to have a fire hydrant on the road by the house, but I think it's the last one on the street. The three houses around the bend aren't very close to it, so the pond would provide water to the firefighters. And I suppose that it would serve in the unlikely event of a fire in the vineyard itself. So this pond was dug and the town put a sign next to it that says the water is for fire emergencies. A few years ago the water level dropped severely (we've been having some drought years) and the town trucked water up from the river to re-fill the pond. Along with the water, they unintentionally brought some weeds that grow so fast that they nearly choke the pond in summer. This past year the town came in and cleaned away all the overgrowth around the edges of the pond, leaving one apple tree, a bunch of shrubs (heavily pruned), and the tufts of grasses on the water's edge. It looks quite nice. There are frogs and fish in the pond as well. In the spring the water is dark with tadpoles. In summer, the neighbor's grandkids bring their poles and try to catch the fish (to the chagrin of the mayor, who doesn't like them doing that; there's a story for another time). The pond also freezes over in winter, but never enough to actually walk on. It's too bad, because I might be tempted to get myself a pair of ice skates. It's the perfect size for one or two! Back in November I visited a few small towns in Vermont, most notably Manchester. But in the nearby town of West Arlington, my friend Lorraine and I found this gem of a covered bridge. Looking out of town through the covered bridge. The town is nothing more than a few houses and farms in a beautiful little valley. The bridge is there, crossing the valley's stream from the main road to the town's church and community building. We stopped for a few minutes to walk over and around the bridge and take in the views of the fields on the valley floor and the woods covering the gentle mountains on either side. 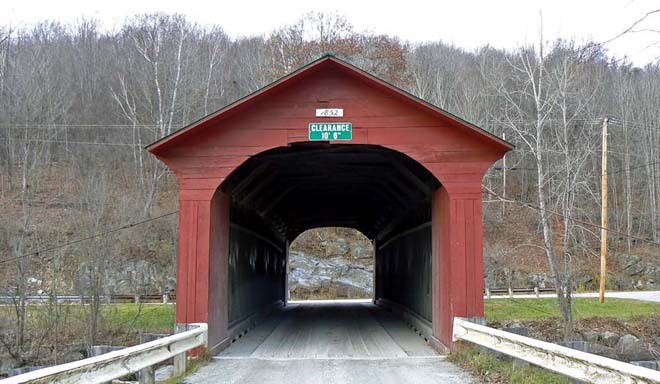 This was the first of two covered bridges we would see that day. A rather stern warning painted on the bridge. If I remember correctly, my readers identified the plant that produces these seed pods as a variety of gênet (broom). There is more and more of it around our region; I suppose it's spreading. Could it be the result of climate change? 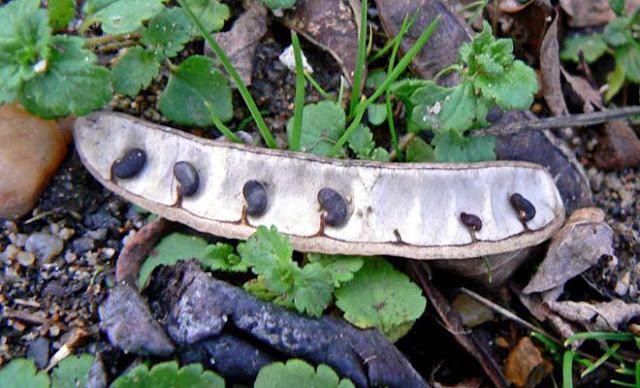 A broom seed pod split open on the ground. 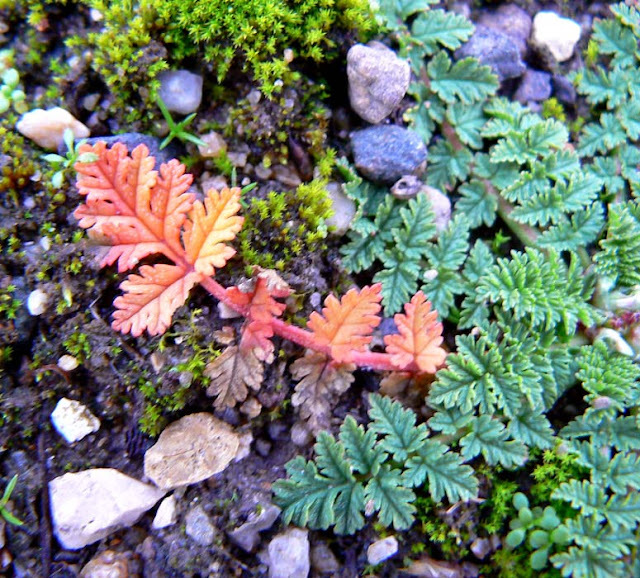 The edges of the vineyard are interesting places where all kinds of plants give it a go. Every year the edges are trimmed back so that tractors can pass and to keep the woods from encroaching on the vines. This makes opportunities for new plants (their seeds spread by wildlife I presume) and also keeps the weaklings out. Well, maybe not. 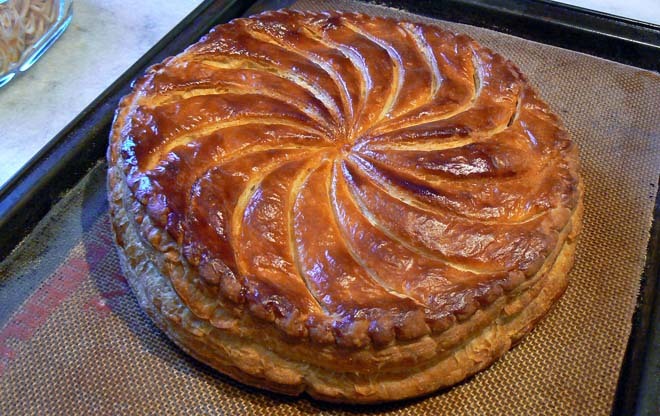 But we did have the traditional French galette des rois, in celebration of the epiphany. It's a tart made with pâte feuilletée (puff pastry) and a filling of frangipane (almond paste). The bottom half of the dough, with frangipane, and the fève. I make my own pâte feuilletée these days as well as my own frangipane. So naturally, I make my own galette. Given that these little cakes go for ten to fifteen euros in a bakery, I think I'm getting a better deal making them on my own. Mix 250 g flour, 12 cl water, 5 g salt on a cool surface. Work the dough lightly and wrap it in plastic. Place it the refrigerator for 30 minutes. The finished galette, with edge and top decoration done with a sharp knife. Put 250 g butter in between two sheets of plastic wrap and flatten it into a rectangle of about 1 cm in thickness. 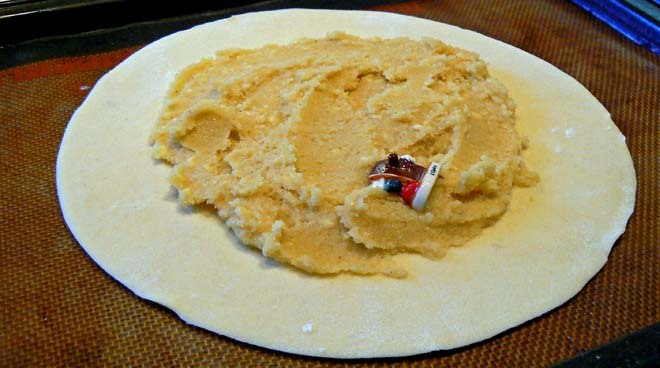 Roll out the dough so that it is bigger than the flattened butter. Place the butter on top of the dough and wrap the dough around the butter, enclosing it completely. Roll it with a rolling pin, making it uniform and rectangular. Make the first turn. That is, turn one third of the dough over on itself, then turn the other third over on top. It sounds complicated, but it's not. Wrap the dough in plastic and refrigerate for an hour. After an hour, roll the dough out lengthwise and make a double turn. 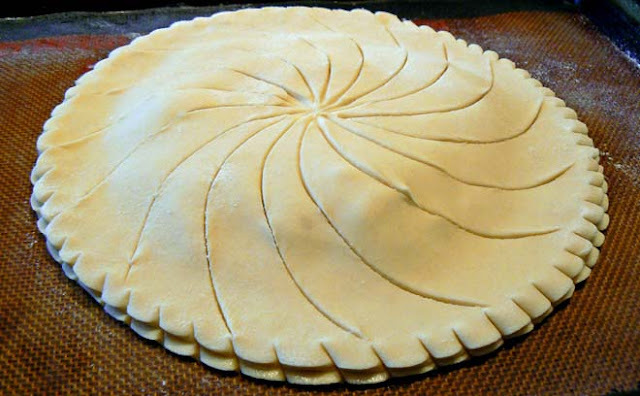 That just means to turn a quarter of the dough over on itself, turn the opposite end over the same way so that the two folded ends meet in the middle, then turn the dough over itself again. Repeat the double turn step six times, allowing the dough to rest in the refrigerator for an hour in between each turn. This is the hard part, because you need to be there each hour to take the dough out of the fridge, roll it, and fold it. This is what retirement is for. A slice of the galette des rois. To make the galette, you roll the dough and cut two rounds, fill it with the frangipane, make some nice decorative cuts on top, glaze with an egg wash, and bake in a hot oven. I don't know what they're called. But I see them all over the ground beside the dirt road through the vineyards. Some of them are bright green, other stems have turned an orangy-red. The "dead of winter" doesn't include these. They seem to survive freezing weather just fine. Unless the orangy-red branches are ones that have not survived, in which case that is the explanation for their color. I've been experimenting with my camera again. Digital cameras have all kinds of features that go unused, I'm sure, just because there are so many of them. Changing settings requires first, knowing that they're there, and second, having the time to adjust the camera before pressing the shutter release. Travel books fill up one shelf in the den. I think I'm like many people in that I have my camera set up for basic stuff, and only make minor adjustments while taking photos. I've recently noticed that I have a feature that will take images in TIFF format. These are really big photos, ten times the size of the standard six megapixel image I normally take. A few of the dictionaries and language books in the house. The documentation for my Panasonic Lumix camera says that the TIFF image is best for when you are printing a picture or when you want to do an extreme crop and enlarge a small portion of your image. Trouble is, when I'm out taking photos, I don't really know what I'm going to do with them later, so I never think to change the setting. Photos, wine, language, and gardening. Yesterday I took some pictures of the bookshelves in our guest room/den in the larger format just to see what I could see. The standard JPEG images came in at 1.5 megabytes, and the TIFF format images came in at over 15 megabytes. But I really couldn't see many significant differences on the computer screen. Fancy French literature and pop English and American stuff. When I take standard photos, my one gigabyte storage card can hold well over 300 photos. In TIFF mode, I can only get about 55. I suppose if I'm taking portraits or long shots, it might be worth switching to TIFF mode. I'll try to keep that in mind. January 1992. Ken and I were touring around Normandy and Brittany in a rented car. It was dark, wet, and cold most of the time. Still, we enjoyed eating mussels and visiting new places along the channel and the coast. And there were no crowds. One afternoon we stopped to walk around in the old section of Granville, on the Cotentin peninsula. I've posted other photos from that day here. I took this picture as we walked along the wall that surrounds the town up on its rocky point. A favorite new appetizer for us this past year has been little rolls of smoked salmon stuffed with céleri rémoulade (grated celery root in a mustardy mayonnaise with cream). They're pretty and are a good finger food when having a glass or two of wine with guests. Smoked salmon with céleri rémoulade. The past couple of days we've done a little variation on the appetizer by making it into a full-blown first course. 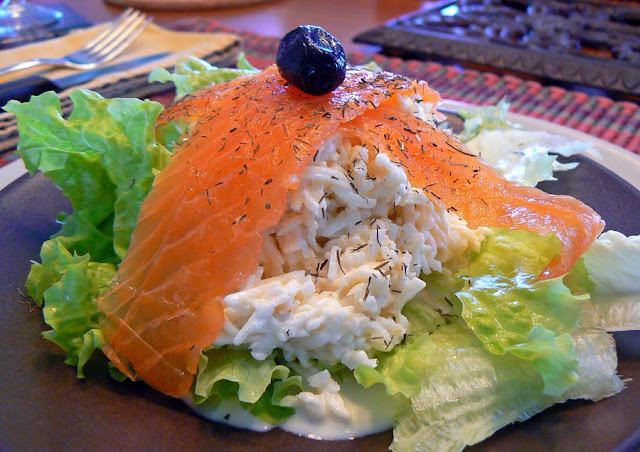 Instead of rolling the salmon around small amounts of céleri, we lay the slices over a larger portion of salad and serve it on a bed of lettuce, accompanied by a black olive or two, and sprinkled with a little dill. It's 2010. Wow. When I was younger, I would marvel (does anyone ever marvel anymore?) at how futuristic that sounded. The Year Two Thousand Ten. Our not-too-distant future held the promise of great technological advancements for mankind, and many of those promises have been fulfilled. But some have not. I expected that by now we'd all be jetting around in flying cars and taking vacation trips to the Moon and Mars. Just like George Jetson did. 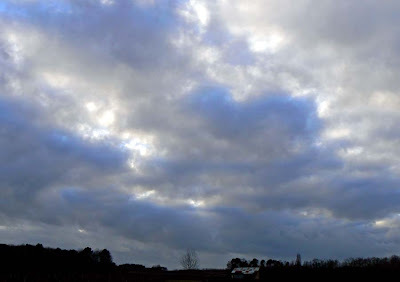 Another view of the vineyard sky. I knew that I'd still be relatively young in 2010, if I survived my inherited bad genes and the fickle finger of fate. But it always seemed so far away, this futuristic year. And yet here it is and I'm still going strong at fifty. But there are no flying cars. I wonder what happened. Whatever it was, I've concluded that flying cars were not a very good idea after all. I mean, with traffic these days, can you imagine? We did get flying buses, though, and even if the actual airline traffic above our heads can resemble a freeway at rush hour, at least the people driving those things are trained professionals. Think about trying to merge your FUV (Flying Utility Vehicle, what did you think it stood for?) into traffic at fifteen thousand feet and none of those idiot drivers will let you in; it's a long way down. Not to mention that cops would likely be hiding behind every cloud to make sure you don't go faster than 365 miles per hour. As if you could in this traffic. As for vacations on the Moon and Mars, I haven't even seen half of this planet yet. And frankly, I don't trust the airlines to make a space flight comfortable. You know how it would be: Oxygen is complimentary, but gravity is five dollars. Your luggage either gets accidentally routed to Pluto or you wait forever because it's on it's third spin around the Van Allen belt. And racing to make those tight connections on Uranus, well, we all know what a pain in the asteroids that would be. Still, 2010 has arrived even if flying cars and civilian space flight have not. We did get Nespresso (what else? ), iEverything, and Lady Gaga. And isn't that futuristic enough for now?